According to the FDA, independent experts identified that "poor plant and equipment sanitation” is one of the top four food safety problems faced by food manufacturers today along with "deficient employee training", "contamination of raw materials" and "poor plant design and construction". Cleaning and sanitation of food contact equipment is critical to prevent foods from being systematically contaminated by harmful bacteria that might become established on unclean equipment surfaces. One of the procedures commonly used to prevent this is Clean In Place (CIP) or Steam In Place (SIP). These operations automate the cleaning of equipment with minimal dismantling of production equipment or portions of the equipment as well as related production tools. In order to prove that cleaning was effective, records of all CIP operations should be retained in case product problems arise. Significant amount of energy, water and chemicals consumed by CIP systems can impact plant availability and sustainability. Some studies show that with the CIP data analysis, cycle cost, energy use, water use can be reduced by over 40% and cycle times by over 10%. XLReporter provides the appropriate technology for different circumstances. 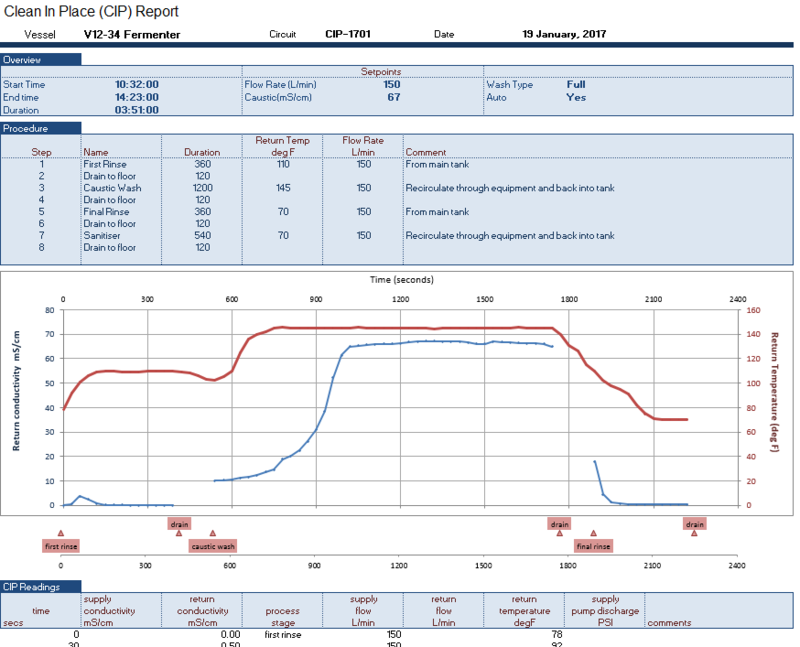 For implementations of CIP/SIP that cannot justify the inclusion of a data logger, historian or database, XLReporter provides Report As You Run technology. For implementations of CIP/SIP that perform data logging, XLReporter provides Event Frames technology. The purpose of these technologies is to limit the report data to the time period of the cleaning cycle.